The holidays are a magical time to visit New Ulm. Beginning in late November and throughout December, downtown New Ulm is adorned with natural evergreen boughs, trees and lights – a tradition since 1925. The historic downtown is lined with 60+ real Christmas trees. Real garland, lighted for the season, hangs across the streets. Storefront windows are full of holiday items for sale. 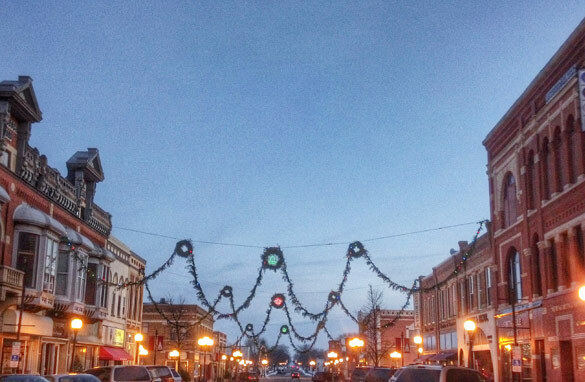 It smells and feels like Christmas in Downtown New Ulm during the holiday season! Annually on the Friday evening after Thanksgiving, New Ulm welcomes Santa to town with a Parade of Lights. 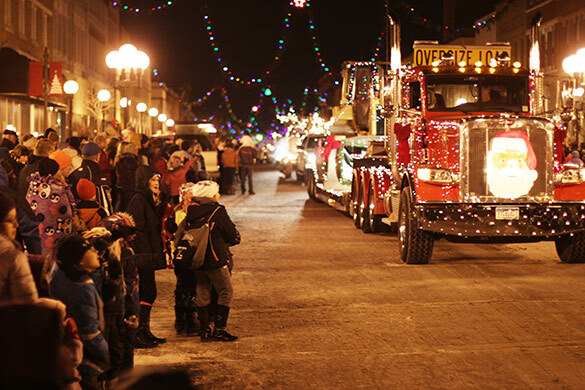 The 31st Annual Parade of Lights will be held on Friday, November 29th, 2019 at 6pm. Over 60 units, all decked out with thousands of twinkling lights, makes its way through our Historic Downtown. Children of all ages will delight in this parade! This is a great time to check out our shops and restaurants before and after the parade. Head to City Hall after the parade for the Official Christmas Tree lighting ceremony. Mayor Bob Beussman will lead the ceremony with some help from the New Ulm Royalty and Santa himself! Also, be sure you stop by the Brown County Historical Society Museum for their Holiday Open House after the parade! Check out their new exhibit designed for the holidays! Gather your family and friends and get in the Christmas Spirit at this annual event! Traditionally the biggest shopping day of the year, New Ulm's retailers will have sales and specials galore! You're sure to find something for almost everyone on your list! A nationwide shopping event promoting small, privately-owned businesses, held annually the Saturday after Thanksgiving. Check out their Small Business Saturday promotions, Shop Local, and show your love for these unique, specialty retailers! Want to learn more about decorating your home for the holidays? Attend a holiday workshop with your girlfriends, and take home beautiful Christmas items you created! New Ulm has several holiday workshops taught by decorating experts held throughout the season! Check out the Community Calendar to find these dates. There's nothing like the holiday tradition of the Christmas Luminaries Display at Schell's Brewery. 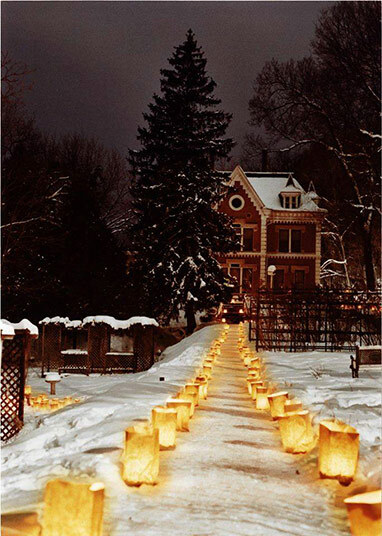 Every year, the Marti family lights luminaries on the Schell's Brewery grounds and invites the public to come stroll through the park (1860 Schell Road). They are lit on Christmas Eve and Christmas Day at 6pm. www.schellsbrewery.com, or 507-354-5528 for more information. Morgan Creek Vineyards hosts a number of events during the holiday season! Join them for Wine Diva Days over the weekend of the Holiday Shopping Opener, November 8-10, 2019! Wine Diva Wine Sale: 10% off 6 bottles of wine 15% off case wine, 15% off all merchandise. Enjoy wine tasting, and wood fire appetizer menu from the Winery Café. November chef's special and a glass of Saint Wenceslaus! Discount sales throughout the gift shop all weekend! Make reservations also for the Christmas Candlelight Winetasting at Morgan Creek Vineyards on November 15, 2019. Gather ‘round the burning bowl for the last Friday evening event of the winter season. Dress warm for vineyard sleigh rides and head into the tasting room for an evening of mulled wine, appetizers, holiday music, and merriment. Kick off your holiday season like never before with the Morgan Creek Vineyards Holiday Open House held December 7-8, 2019! Travel to New Ulm and stay for the entire weekend of holiday festivities. Free and open to the public, mulled wine, gift basket and year-end merchandise, and the best wine sale of the season! Complimentary sleigh rides with purchase on Saturday from 1-4 (weather permitting). Start your day on Sunday with brunch and music from 11am-2pm. There are many more events and activities that take place in New Ulm over the holidays season, including the family-favorite Skate with Santa, Christmas theater performances, holiday concerts and more! Visit the Community Calendar for a complete list!